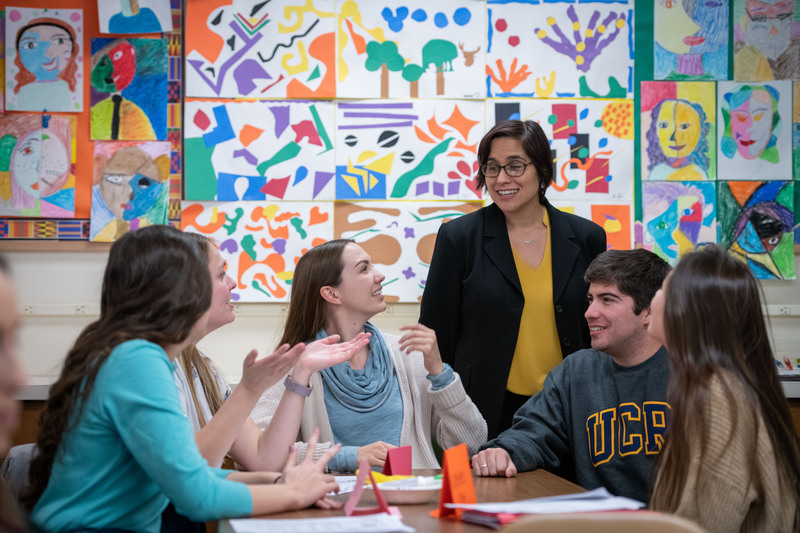 The Teacher Education programs at the UCR's Graduate School of Education will prepare you to be a critical-thinker and well-rounded educator who addresses the needs of all students in culturally responsive ways. Through relevant coursework and valuable fieldwork with partner school districts, our programs train aspiring teachers to serve schools through social justice oriented, community engaged frameworks. In addition to developing pedagogical skill and rigorous content knowledge that align with Common Core State Standards, our programs train teachers to use theory to guide practice, approach teaching using collaborative and co-teaching models, practice restorative justice and models of authentic care, and integrate arts and technology across disciplines. Students participate in professional development activities including a Mock-Interview Day, resume critiques with district representatives and educators, and an annual UCR Teacher Job Fair exclusive for student teachers and alumni. You can choose to earn a California teaching credential only, or you can simultaneously earn a credential and a Master’s in Education degree in just over a year. We encourage you to review our programs, and request more information or contact an advisor to decide which program best aligns with your career goals. Learn more about our Masters and credential programs. Apply by the priority deadline of January 18 and automatically qualify for scholarships ranging between $3000 and $5000 if admitted. You may also qualify for additional scholarships and financing to further fund your education! Visit our funding page for a complete list of opportunities and more information. Increase your versatility to teach in dual language immersion classrooms. Option 1 - Bilingual Authorization (Spanish). You must pass subtests III, IV and V. You must pass at least subtest III by program admission deadlines. Option 2 – Complete Bilingual Authorization Prerequisite Coursework.